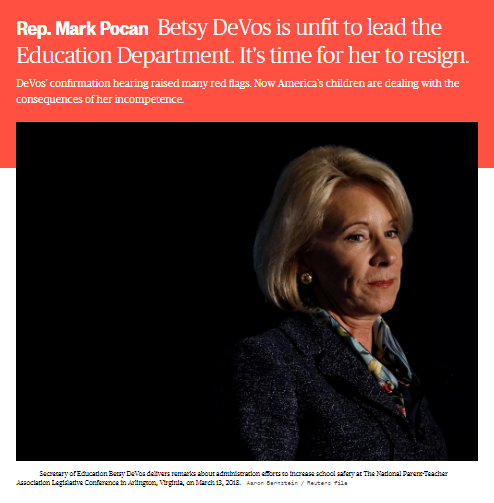 Representative Mark Pocan, co-chair of the Congressional Progressive Caucus, had this to say with regard to Education Secretary Betsy DeVos, "DeVos’s assault on public education does not end with her ultimately retracted call for the elimination of funding for Special Olympics...." Looking at DeVos' budget proposal, one finds the following assertions: (1) "In fact, students may be better served by being in larger classes, if by hiring fewer teachers, a district or state can better compensate those who have demonstrated high ability and outstanding results"; (2) "21st Century Community Learning Center programs do not generate consistent student attendance or yield consistently improved academic outcomes"; (3) "This Budget builds on our efforts to give families more freedom, so that families can find the best educational setting for their children". Secretary Devos believes in larger classes, no after-schools, and school choice. And she says this is supported by evidence from research. In this respect, one really needs to qualify the research. There is education research that simply establishes correlations and makes use of statistics. There is, however, education research that is designed to extract cause-effect relationships and establishes the mechanism behind such relationships. With mere correlations, one may find published data that may or may not support a relationship since in these cases, how the experiment is designed can yield conflicting results. What is particularly useful in education are studies where not a mere correlation is portrayed but also a logical underlying mechanism behind the correlation. This is important especially when considering the three items DeVos has considered: large classes, no after-school, and more school choice. Let us begin with "school choice". 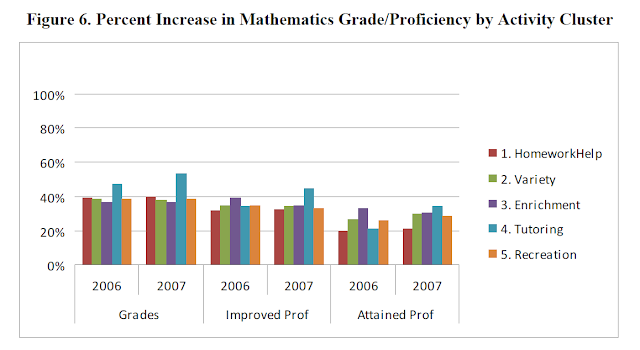 First, there is no research out there that convincingly shows charter schools improve the delivery of basic education. And this is expected since there is really no mechanism that can explain how by just giving parents the choice can make schools better. Evidence from research is clear on this. Papers that often tout the success of charter schools miss the fact that these schools often select students who are already high-achieving. It is ridiculous to suggest that larger classes benefit education. The fact that each learner inside the classroom is an individual means the larger the class, the greater the effort and time a teacher must give in order to tailor the instruction so that it reaches each and every student. What research tells us is that there is perhaps a compromise between size and cost, emphasizing that there is indeed a great risk if classes are large in size. 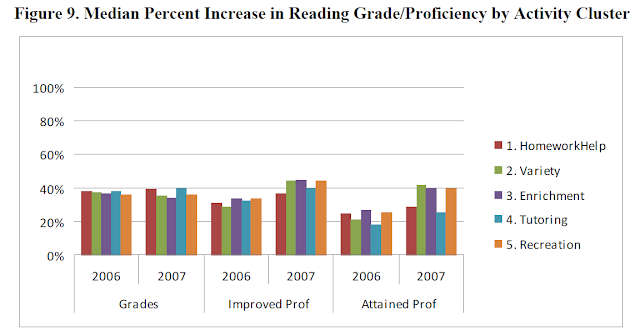 Chingos and Whitehurst wrote about this years ago at Brookings in which they state: "The most influential and credible study of CSR is the Student Teacher Achievement Ratio, or STAR, study which was conducted in Tennessee during the late 1980s. In this study, students and teachers were randomly assigned to a small class, with an average of 15 students, or a regular class, with an average of 22 students. This large reduction in class size (7 students, or 32 percent) was found to increase student achievement by an amount equivalent to about 3 additional months of schooling four years later." Naftzger, N., Vinson, M., Bonney, C., Murphy, J., & Kaufman, S. (2009). 21st Century Community Learning Centers (21st CCLC) analytic support for evaluation and program monitoring: An overview of the 21st CCLC performance data: 2006–07 (Fourth Report). Washington, DC: U.S. Department of Education. These are percentage increases, not just size effects. These are the effects seen if one considers only the scores in standardized tests, but after-school activities are designed not just to enhance performance in these tests. After-school activities have effects in other as equally if not more important aspects of basic education. Education should never be viewed in terms of dollars. The price of failing in basic education is so high that no savings can justify. "Why Can't Our Students Read?" Are We Using Formative Assessments Correctly?